THE Australian and Papua New Guinea governments are progressing rapidly to deliver a new high-speed Coral Sea Cable that will connect Port Moresby to the global economy through Sydney. Yesterday, marine survey vessel the RV Northern Endeavour visited Port Moresby to survey the area where the cable will connect to Papua New Guinea’s mainland. Local media had the opportunity to go on-board the vessel to see the facilities, meet the crew and understand more about the process of delivering this key infrastructure. Australian High Commissioner Bruce Davis, who also went onboard the vessel, said: “Australia is delighted to partner with Papua New Guinea in delivering this key nation-building project. 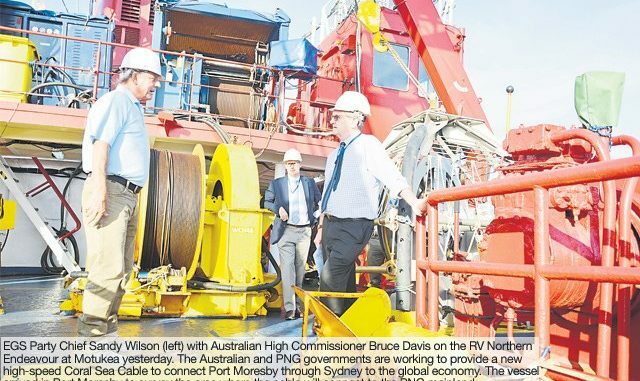 The RV Northern Endeavour is at the start of a journey to map out the path the cable will take between Port Moresby, Honiara and Sydney, the Australian High Commission said. Not only does this preliminary planning ensure that the installation of the cable is as efficient and cost-effective as possible, it also provides assurance that the impact of the cable on PNG’s pristine marine environment is minimal, it said. Linking the three countries in one project provides a lot of efficiencies in design, construction and procurement, an Australian Department of Foreign Affairs and Trade spokesman told Business Advantage PNG. The first step will be to appoint a marine vendor, who will build and install the cable after it confirms the precise route. Local companies in PNG and Solomons are expected to be involved in the building of local landing points. Australia will fund the link using up to A$200 million from its overseas development assistance fund.